Should You Have Your Cat Declawed? Many new cat parents feel that having their cat declawed is doing their cat, and their furniture a service. After all, a cat that is declawed cannot scratch your furniture, shred your toilet paper, fray your rug, or scratch your kids, right? These points may be true, but there is a dark world lurking behind declawing your cat that many people overlook. You're probably wondering what in the world could be the downside? Well, it is simple. Having your cat declawed could be a death sentence for your furry little companion. Cats have a natural instinct to go outside, whether you like it or not. Lets face it, you don't always guard the door with your life, especially when carrying in groceries. My cat Misty, in the above picture, is not declawed. However, one simple incident where she slipped out the front door and now, Misty is a three legged cat that is worth a whopping $3,500. Dogs need exercise to be happy and healthy. Each dog has their own specific needs when it comes to this topic and no two can be compared. Exercise for dogs is the same for you. If you don't get up and moving enough everyday, you will have trouble sleeping and be antsy and full of energy. Your dog use energy as an outlet in many different behaviors. Chewing and tearing up your house is the most common. Here is how to tell if you are giving your dog enough exercise. If your dog is running thorough the house and puling things over, he is hyper and needs more exercise. After a while of exercising your dog, you will be able to tell how much your dog needs on average. Everyday you need to gauge whether or not your dog needs more or less exercise. A well exercised dog is calm and collected. They are able to sit still for short periods of time. Do not expect your dog to be an addition to your carpet, they are going to be up and moving around constantly throughout the day. ~~ Jogging is a great way for high energy dogs to get their exercise. if you have been planning on loosing a few pounds, this can be a great opportunity. The exercise partner that you have been looking for to start your resolution, has been your fur-baby all along. ~~ Frisbee is a great way to help your dog get out some extra energy. This is especially true for dogs that like to jump and run. 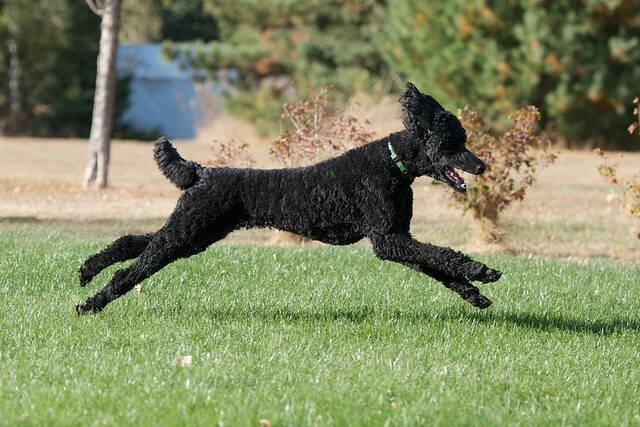 ~~ Fetch is an amazing way to help your high energy dog get the ants out of their pants. Always be aware of any physical condition that your dog has. If they have any physical or internal concerns, do not exercise your dog. Exercising a dog with heart problems is a big no no unless you have spoken to their vet first. Review any medication that your pet is on before starting exercise. Understanding your dog's limitations is very important as well. Do not over exercise your dog. Keeping your dog hydrated during exercise and on hot days is very important. Do not leave your dog tied outside if you stop somewhere on your jog. It does not take long for a dog to become overtaken by heat on a summer day. Aztec and I working on this exact post. He is such the lazy worker. Through the years of working with dogs and training them. I have realized that many people do not know how to read their dogs. For the most part, people think dogs should react the same as humans do. This is not the case at all. We can learn to read our pets by watching them. You can learn their needs, their wants, and their behaviors to learn their comfort level. When people bring their dog to me for training, they say their dog is behaving this way or that way, and feel that their dog just has behavioral problems. 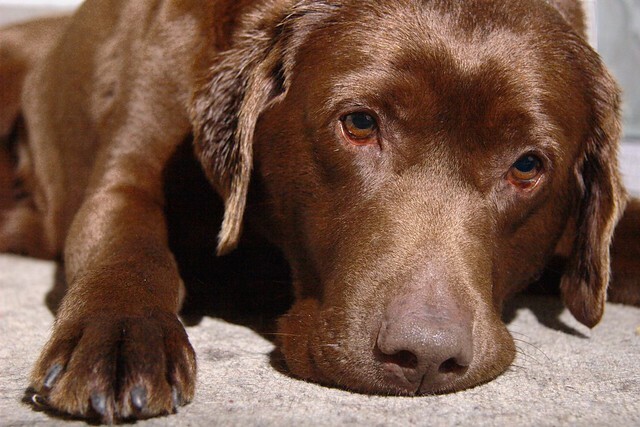 What humans see as behavioral problems, may just be a dog's natural instinct, or body language. Here is how to tell what your dog is thinking. Body language is how dogs communicate with other dogs, and they can also communicate with you the same way. Ears lowered and slightly back: Your dog is saying it is calm. Their mouth should be closed, and their eyes are calm as well. Their ears raised and eyes are open, possible panting and tail wagging: I heard something I like, or I want to play. Ears forward, alert eyes, pulls ears toward their head: I don't like it, and I don't want any part of it. Eyes narrow, teeth showing, ears flat, tail held high for balance: I am going to bite it if it/he/she gets any closer. This is not a safe situation. Your dog feels threatened and wants to get away. Standing tall with tail up: Confident, possibly thinking of playing. Hunching over, trying to look small, tail between legs, pupils dilated: Your dog is afraid. Front legs lowered, bottom in the air, tail wagging: Your dog is saying he wants to play. Stiff legs and rigid body, ears flat back, hair on their back stands up on end: Your dog is showing aggressiveness, or dominance. My dog Remy is normally a very well behaved pup. Imagine my surprise when I walked outside today, he had destroyed my flowerbed. There were pink petals everywhere and he had covered himself from head to toe with dirt. My first instinct was to get upset. I then realized, I had been so wrapped up in my morning that I forgot our daily game of fetch. He had torn up my flowers because he was bored. If your dog loves to do things like this, you may think that he needs more training or you are not strict enough. The rules and his training may not be the issue. By watching your dog's behavior, you can learn what type of stimulation he needs more of. Many cases of your dog getting into mischief can be solved by the follow topics. Toys: Ensuring that your dog has toys that suit his needs is very important. Chewing is a way to relieve tension and frustration. It also helps a dog keep their teeth clean and prevent decay. Outside Play: Giving your dog a good amount of outside play is a great opportunity to exert some energy and get the necessary stimulation. Dogs that are well exercised are calmer inside the house, and find less trouble to get into. A game of fetch will benefit you and your pup. Walks: Some dogs need two to three walks per day to keep them happy. Other dogs need more exercise. Walks are a great way to socialize your dog as well. After a controlled introduction, your pup can spend some energy romping around with a playmate and give you a much needed break. A Second Dog: This is not recommended for everyone, but some dogs thrive better when they have a live-in play mate. This does add more time that you will need to spend with your pets, but if you are a pet lover, this may be a great opportunity to expand your family. This may be especially true if you work away from home and your pet gets into mischief because he his bored when you are gone. If getting a second pet is not for you, schedule play dates with a friends dog. This could give him much needed socialization without a long term commitment. Let your pet show you what he needs more of. We all need exercise to feel calm and collected, so does your pet. Good communication between you and your pet is the easiest way to find the solution to problem behaviors.